Thank you to the Washington Post for including this post in your Blog Watch, July 9, 2009! Last week, while visiting family in Washington, DC, I made a trip to the wonderful antique store Marston Luce. I had just read the new issue of Southern Accents on the airplane ride to DC, but did not make the connection between the store and the article on Luce's beautiful home in France until the seeing the magazine in the store; when I commented on what a good issue it was, the store manager made the connection for me. Hill Country House did a wonderful write up of the article and the 'humble elegance' of Marston Luce. I snapped a quick iphone picture of the window display at Marston Luce; the Swedish settee truly beckoned me into the store. While I was in the store, my sister pointed out that famed Washington DC based designer Frank Babb Randolph was in the store with a client. In my world, famous designers are like celebrities. I was more excited to catch a glimpse of Randolph than I would have been to see Brad Pitt (well, maybe that is an exaggeration). Although I did not rush over and take a picture and ask for an autograph, I did surreptitiously listen in on Randolph's comments on the various antiques in the store, and his conversation with the shopkeeper. It was quite interesting to see what caught his eye that day. This chest was of particular interest! Randolph does not have a web site, but many of us are familiar with his work from reading magazines and blogs. These pictures of a beautiful white kitchen are perhaps some of the most popular images of his work to circulate on the blogs; I have posted them quite a few times on my own blog, as the beauty of the kitchen and the conservatory style breakfast room inspire me every time I see them. I also love the little sidelight windows on the wall next to the sink. Image via Southern Accents, photography by Tria Giovan. This beautiful living room is from Randolph's own home, which was profiled in Washington Spaces magazine. I always think it is fascinating to get a glimpse into the personal space of a designer - it is often the best reflection of their own true style. I love the mix of antiques with new items, the beautiful French doors that fill the space with light, and of course, the contemporary art by Elizabeth Dax above the fireplace. Image via Washington Spaces, photography by Kenneth M. Wyner. A view of the other side of the living room. I love the lines of this sofa (the Gabrielle sofa by Niermann Weeks)! The tall mirror and the exquisite sconces are my favorite elements in the room; clearly Randolph is exceptionally talented at scale and proportion, because the sconces in relation to the mirror seem perfect to my eyes. The soft, pale colors of the room really speak to me. I am a huge fan of light floors, and clearly Randolph is too. The rich, dark color of the mahogany dining table (custom designed by Randolph) is the perfect element in this light room. Notice the feet of the table, which are nickel plated lion's heads. The symmetry in this room is so pleasing to the eye. Image via Washington Spaces, photography by Kenneth M. Wyner. The exterior of Randolph's Georgetown home. Image via Washington Spaces, photography by Kenneth M. Wyner. When I saw this picture on the cover of Washington Spaces last year, it inspired a post on light floors that remains one of my all time favorite posts. I recently came across a quote from Randolph about light floors; he believes that they make the furntiture really dance. This home was a 1960s Georgetown showhouse that was transformed by Randolph. I love the combination of the bleached oak floors and the luxurious melon and lime striped silk curtains. Also note Randolph's use of a contrasting fabric on the back of the chairs. Image via Washington Spaces, photography by Morgan Howarth. The dining room of the showhouse is simple and elegant. The coral curtains and skirted table add an infusion of color. I must admit, I have a great fondness for coral silk! Another space that Randolph decorated, this time a Georgetown townhouse from the 1800s. More and more, my taste is transitioning to chairs with straight elegant lines like these. Randolph also worked on the Vice President's residence for former VP Cheney and his wife Lynne. "We transformed the house using a simple, monochromatic palette," Randolph said, and used antiques, art, classic upholstery, and billowing silk curtains. Image via Washington Post. Another picture of a room from the VP Mansion, with a large dramatic piece of contemporary art by Helen Frankenthaler taking center stage. Lynne Cheney said that one of the best perks of decorating the VP Mansion was being able to borrow extraordinary pieces of art. Image via Washington Post. When researching this post, I realized that there is a certain look to Randolph's rooms, one that I like very much. He often uses full richly colored silk curtains; a monochromatic palette punctuated with bursts of color in the art, curtains, and pillows; a mix of best quality reproductions and beautiful antiques; often there are light floors or light, neutral rugs that unify the space and provide a wonderful backdrop for the items in the room. In his own home, Randolph has a fondness for painted European furniture and beautiful chairs - go back and and look, and you will see such a variety in the number and styles of chairs. He clearly has a love and appreciation for beautifully made chairs! Thank you for those picts! Absolutely beautiful. I posted that kitchen once - I believe it is my all-time favorite kitchen -my dream kitchen. Things that Inspire - Thanks so much for the mention. What a wonderful, extensive post. So glad we connected and you had such fun at Marston Luce AND had your "celebrity sighting"! The next best thing would have been to be in the store with you! I love his style - the light background and pops of color. To TheOldPostRoad, I think that kitchen is my dream kitchen, too. Great examples of Mr. Randolph's work - thanks so much! I imagine feeling very serene if they were places I kicked up my feet! Love the lightness of these images, and the art is phenomenal! What beautiful rooms! And what a great experience to get to be a fly on the wall while an expert is discussing his craft. I agree with everyone else, that kitchen is a dream kitchen. I don't think it gets any better than that breakfast room. WoW! I have liked that kitchen but was not familiar with the designer. His work is so relaxing. Everything is so elegant yet livable - well at least if you have lots of money livable. Oh gorgeous rooms! And how lucky for you, to be able to eavesdrop on Randolph's conversation. What did catch his eye in the shop? I actually looked on the Marston Luce website for the Danish chair that Randolph commented on, and could not find it - perhaps it sold? 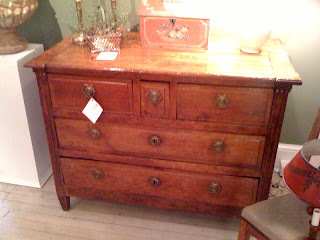 There was also a lovely antique chest- he loved the lines of it - I think it is the French chest on the site, let me double check with the person I was shopping with. I love those perfectly impractical curtains in the Washington Spaces photo. And all the peachy tones - so hopeful and dramatic all at once. Psssst! I think Randolph's front door may be the entrance to heaven. Beautiful rooms and a great post. I have saved the living room for several years. I love the art over the mantel such a bold and perfect choice. So glad you made it to one of my favorite stores while here in my city! Randolph's home was on the Georgetown housetour last year and it was such a treat to go in -my favorite home on the tour by far. It looks much bigger in the photographs than in real life but each room is a jewelbox!! He is my favorite local designer, by far. It's too bad you didn't run up and ask to have your picture taken with him. He would have loved it! Frank is truly one of the nice guys in the business. OK, I added a picture of a chest that Randolph and his client were raving over! It was taken with an iphone, please excuse the quality. Now I wish I had talked to him! When you google his name, this post comes up as one of the first few items. Love those draperies in the pictures! I am not usually a star struck type of person, but if I saw a designer I admire and love, I would absolutely lower myself to groveling for a picture! The CHAIRS are what I first noticed. Randolph uses them like pieces of sculpture--no need to have identical pairs or suites... simply comparable size, quality of design and workmanship all pulled together with amazing fabrics. Great post. I love the look of these rooms... his curtains are as sumptuous as can be! when i was horse showing in the winter circuit, i was completely awestruck by the famous show jumpers and their riders. i felt like a little groupie. i could barely speak when one of them would speak to me. ....i was like, "are you talking to me?" it is awesome. i love every detail. I too adore the lighter floors and all the silk drapes with bright colors. I can imagine you perking your ears to hear what he might be saying. :>) The white kitchen is an envy. This was a wonderful post! I love the look of these comfortable, calming, restrained yet comfortable rooms. LOVED it! I recall whenI first saw the article on the former VP/Cheney residence in the Post. I clipped the photos and filed it in my inspiration file. Loved the artwork as well as the furniture. I am incredibly inspired by your blog that I shared this site with my blog friends this evening. The pictures are beautiful - thanks for sharing. I like the kitchen pictures the best - I just love white kitchens. Holy moly, look at that kitchen! I don't know if I would cook in it or just sit and admire all of its loveliness. 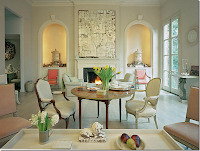 I adore that 'Washington Spaces" image with the french doors and light floors! My favourite! Your posts are always so elegant and stunning! Thanks for the peak inside the Cheney home - I had no idea Randolph had worked on it. His own home is wonderful - and love those yellow chinese chippendale chairs! Now that is a great chance encounter. I love his curtains particularly, xv. What beautiful spaces! Thank you for sharing! WOW! there are soooo many elements I love. Thanks for posting so many pics. PS- thanks for the heads up on the other Shutze home for sale! I have part II up today (Pink Palace) and will feature the home you ID'd and the condos tomorrow. Who knew it needed so much work? What a lovely post and such great info. on Randolph! I just can't stop gazing at all the light & how large the spaces appear!!! Its so relaxing & airy. He needs a website so we all can just recline in his work. How beautiful. And so classic. The kitchen, though we have all seen it and many like it...just takes my breath away! I know what you mean. There is just something about the lightness of this design that just sets it apart. It also manages to use light colors without it looking bare. Breathtaking designs through and through. That is my dream kitchen...white, bright, airy. The windows are beautiful. The Washington Post? What an honor!!! His home is gorgeous. So elegant and light. I'm with you - how exciting to wander into a store only to find he's there too! Congrats on the WP mention -- well deserved, indeed! I love Randolph's look, particularly all the gorgeous bared floors (which have me rethinking my light wood biases). His house is classic DC; love it! Washington Post for the 9th time now (do you have the most? You must by now) I am so lucky to share the honour with you this week!! very nice, that settee would draw me in as well! His home is absolutely gorgeous! I LOVE his style! What a idea to maintain the house.It's look so unique! very sophisticated! Great post! And how funny - I posted an article on White Kitchens and included Randolph's! I didn't know he designed it - thanks for letting us know! Then I see the images of the Cheney residence during his tenure as VP. I was going to leave a comment to say those photos are in my inspiration files. And as I prepared to leave a comment, I see that I left one back in July when you first posted this entry.